I walked into the ultrasound room and felt the complete absence of warmth. No beauty relieved the coldness, no picture of a mother holding a child or a sunset over the water. Nothing to remind those who nervously waited of the potential for joy within the world. A large, heavyset woman poked with her stubby fingers at my thin, slightly rounded body. As the silence continued to descend, the air thick­ened with unspoken thoughts. I looked at this doctor, the expert I had been sent to, repeatedly trying to catch her eye, to shake her unmovable countenance. I wanted to see a glimpse of understanding in her cold stare, but she refused to make eye contact. She refused to make me an indi­vidual. She refused to feel anything for me. And I began to despise her. The pokes with her finger turned to prodding with the ultrasound wand as she silently walked about the room with an air of intellectual superiority, contemplating the defective nature of what lay within me. I found myself suffocating beneath her smugness and the uncomfort­able silence, thinking about her large belly looming over me. I focused on her obesity to avoid thinking about the imperfection held within my womb, about the diagnoses around the corner. I lay on the metal table, completely still, as she spoke in hushed tones with the nurse. The gravity of the situation began to set in. Hot, confused tears started to flow uncontrollably. I explained, blubbering through tears, that we hadn’t realized the severity of the situation, and he had remained home with our other son. The doctor stretched out her plump arm and began drawing repetitive circles on the whiteboard, a demonstration of how she viewed my baby’s predicament. I sat there feeling like a child who was failing miserably at a particular subject in school, but the subject I was failing was that of being pregnant. My teacher drew a large head representing the accumulated fluid and then continued to draw circles around that head, signifying continued growth as the fluid increased month by month. I half-expected her to draw a big BOOM with scribbles and chaos as the head ultimately exploded. Most people have experienced difficulties in their lives at one time or another. The excerpt above is taken from my recently released memoir Sunlight Burning at Midnight and details one of the most heartbreaking periods of my life as I heard a terminal diagnosis in regards to my unborn child. You may have traveled down a similar road or perhaps a different path such as the death of a spouse or a child, for others it may be a divorce, job loss, a wayward child, or a debilitating disease, but one thing is for certain, no one is immune to pain or suffering this side of eternity, and oftentimes suffering brings the undesired side effect such as health issues or depression. I’ve had my share of depression during tragic situations and have even experienced panic attacks. To this day, if anyone in my family, Ryan, one of the kids, or myself, is dealing with an illness that doesn’t heal quickly, my anxiety levels rise rapidly. Through the years I’ve been able to pinpoint more accurately when depression or a panic attack is about to hit, and through that recognition I’ve been able to formulate a few coping mechanisms that work well for me – the biggest one being able to focus on thankfulness and joy – which I often find I’m able to do if I immerse myself in uplifting music and surround myself with positive people who don’t drag me even further into the abyss. 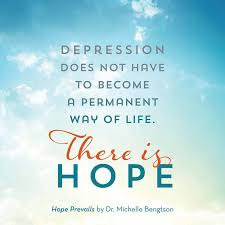 I was recently given the book Hope Prevails by Dr. Michelle Bengtson. Her book explores the connection between depression and tragedy and offers insights on how to rise above the feelings if you find yourself struggling. I appreciated the personal touch that Bengtson offered as she candidly discusses her experiences with tragedy and the accompanying depression she found herself fighting because of the trials. Interestingly enough, she is a trained neuropsychologist, and if anyone should have had all the answers for dealing with depression, it should be her, but what she discovered was that she didn’t. She had to rely on God’s grace and worship music which she found to be beneficial in her personal battle with depression. I would agree as I have also discovered that the right music has the ability to strip away many harsh realities and instead place the listener in the midst of the Almighty God who is able to trade our mourning for joy. It can be difficult to feel God’s presence in the midst of intense pain, and oftentimes we don’t even recognize the good or the lessons learned until we are well past the season of tragedy. Thirteen years past Luke’s birth I see so clearly God’s hand all over his life and also how his story has been magnificently used to bring glory to God and to touch other’s lives. I also see clearly how God wove tragedies from two broken families, mine and Ryan’s, to knit together a beautiful blended family that so clearly illustrates the big family of God, his choosing each one of us, adopting us into the flock, redeeming and loving us and calling us sons and daughters. Today, I’m thankful for the pain because it brought a redeeming beauty with it. Bengston offers the same hope to the reader, “Honestly, I wouldn’t voluntarily choose to endure such pain, nor would I wish it on anyone. But now that I’m on the other side, I can see how even in the midst of such pain God was there. And truly, he used even pain for my good. For that I’m thankful.” (35). As the King of Old reminds us, “There is a time for everything and a season for every activity under Heaven. A time to be born and a time to die. A time to plant and a time to uproot. A time to kill and a time to heal. A time to tear down and a time to build. A time to weep and a time to laugh. A time to mourn and a time to dance.” Ecclesiastics 3 1-4. I am now dancing. Thank you Jesus. Now the exciting part! I have a copy of Hope Prevails to give away to one of my readers! So here’s the deal. 1. Like Jessplusthemess on Facebook. 2. Follow Jessplusthemess on Instagram. 3. Comment either here or on one of my social media sites about your go to method for combating depressive thoughts and feelings. I’ll draw a winner next Tuesday, July 4th!